This year, Oklahoma has had more earthquakes than California. There is a growing body of scientific research that suggests oil and gas production is fueling this increase in seismic activity. A new paper published today in the journal Science, suggests a small number of wastewater wells used in drilling operations could be responsible for many of the quakes. In a field behind a drug store in southeast Oklahoma City, three large green tanks sit on a patch of gravel enclosed by a metal fence and signs that warn of video surveillance. Behind the gate is “Chambers,” one of the highest-volume disposal wells in Oklahoma. When the energy industry drills for oil and natural gas it often strikes water — a lot of water. It’s usually briny and oily, and laced with metals and other chemicals. 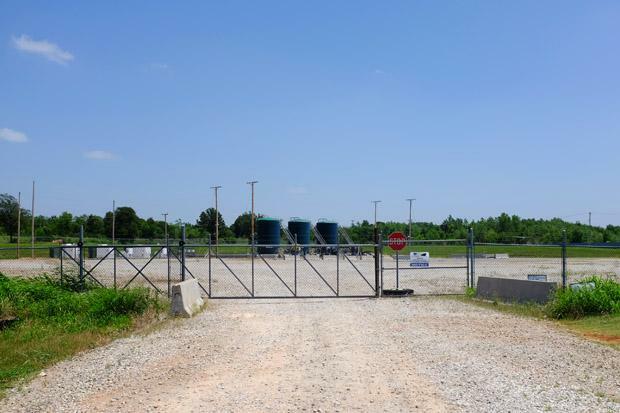 Oil companies inject that toxic wastewater back underground. In recent years, the Chambers well has taken on more water than other disposal wells — about 1.6 million barrels a month, on average, data from the Oklahoma Corporation Commission show. It’s one of four southeast Oklahoma City wells that attracted the attention of Katie Keranen, a geophysics professor and research seismologist at Cornell University. “These extremely high rates can cause a very large area to be stimulated or perturbed in the subsurface,” Keranen says. 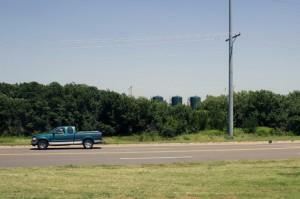 Three high-volume disposal wells identified by researchers occupy a single site in southeast Oklahoma City. 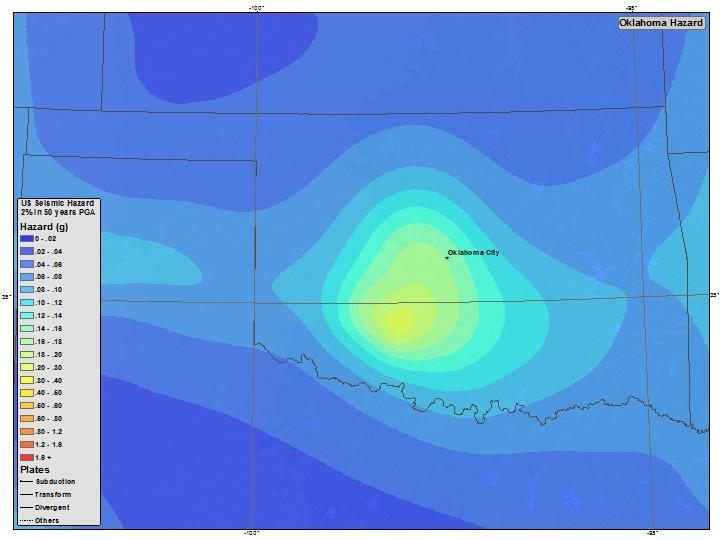 Keranen’s new research focuses on an earthquake swarm near Jones, a small town northeast of Oklahoma City that has become one of the most earthquake-prone parts of the state. Keranen has written several peer-reviewed papers linking disposal wells to Oklahoma’s earthquake surge, as have other federal and university scientists. Previous research focused largely on quakes near Prague, Okla., where a 5.7-magnitude temblor struck in November 2011, injuring two people and damaging more than a dozen homes. The methodology behind the new paper is unique. Keranen and her team fed earthquake and disposal well locations, times, pressure data, and wastewater volume measurements into a three-dimensional model of the rock layers, faults and water formations underground. The scientists wanted to find out how the wastewater flows underground, and where it goes. Keranen’s research shows that wastewater can travel a lot farther away from a disposal well than previously thought. “The area that is perturbed away from these wells is very large,” she says. Her model shows the fluid spreading out over a large area and building up pressure underground. As this pressurized “front” moves underground, it can put pressure on fault lines, causing them to slip and trigger an earthquake. As the area under pressure increases, so does the likelihood that a big fault — or one already near the edge of slipping — will be affected. “It’s very interesting work,” says Bill Ellsworth, a U.S. Geological Survey geophysicist and expert on injection well earthquakes. “We’ve known for years that earthquakes can be triggered remotely by the influence of increasing pore pressure at distances of up to 10 kilometers — so six miles — but this has extended this distance considerably, according to their hypothesis,” he says. Corporation Commission spokesman Matt Skinner answers questions at the town hall event. Oklahoma has more than 4,000 disposal wells and more than 5,000 enhanced oil recovery wells, which are similar, Corporation Commission data show. 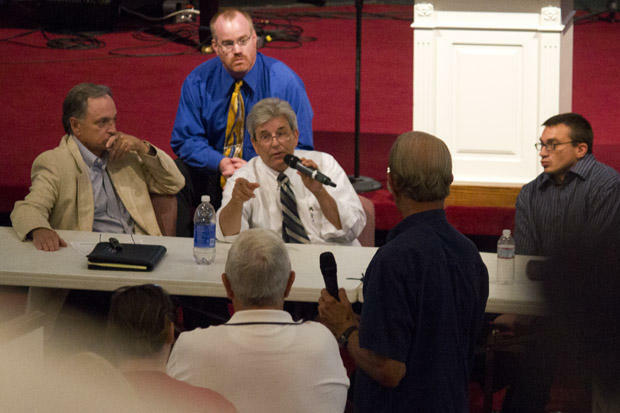 On June 26, the commission, the Oklahoma Geological Survey and two state lawmakers held a town-hall meeting at the Waterloo Road Baptist church in Edmond to answer questions about the earthquakes. About 700 residents showed up for the event, which became heated. There were boos and shouts for authorities to ban disposal wells, which would effectively ban oil and gas drilling — the state’s single-largest economic driver. Spotts doesn’t think Oklahoma officials are doing enough to address public safety concerns posed by the tremors. Both the state’s seismologist, Austin Holland, and the Corporation Commission’s Tim Baker, who oversees disposal well permitting and regulation in Oklahoma, told the crowd that a moratorium was impossible and unnecessary. Keranen says a ban would do little to stop the quakes. “It would take likely years for this fluid pressure that’s already there to diffuse away, and so you’d see earthquakes continuing,” she says. While the new research suggests that high-volume disposal wells might be playing a big role in Oklahoma’s surge of earthquakes, it doesn’t blame any specific well for causing the quakes. Scientists say they will likely never have the data they need to prove that kind of cause and effect. Tulsa-based New Dominion owns the four high-volume disposal wells highlighted in Keranen’s study. The company declined an interview request, but dismissed the findings in an emailed statement and said it’s operating within “permitted parameters” and cooperating with state officials. While New Dominion has not had adequate time to thoroughly review the paper, an initial review reflects it is premised on certain false assumptions. The company notes the author did not consult with NDL’s geologist and engineers to determine whether her premises are in any way correct. At best, these incorrect assumptions are irresponsible. NDL will make no additional statements while it consults legal counsel on this issue. “This is a very important piece that needs to be carefully reviewed,” he says. Skinner also acknowledged that if Keranen’s research proves correct, the oil and gas industry’s link to the earthquakes could actually be easier to manage. That’s because while Oklahoma has thousands of these wastewater wells, regulators might only have to write rules for the small number of high-volume wells that may be causing the most shaking. Oklahoma has been rattled by a surge of earthquakes, which many scientists say is likely linked to oil and gas drilling. On Thursday night, residents packed a contentious town hall meeting to demand answers from public officials. Joe Wertz from StateImpact Oklahoma reports. There was booing and shouts for regulators to impose a moratorium on the oil and gas disposal wells. Local resident Ester D. Blaine said she had to take all the pictures off her walls. She says citizens and scientists don’t stand a chance against Oklahoma’s oil and gas industry. Oklahoma native and Los Angeles Times reporter Hailey Branson-Potts looks at the rise of earthquakes in Oklahoma, which has already had twice as many earthquakes this year as in 2013.